Discussion in 'The Garage' started by Rexxis, Apr 4, 2013. The bike starts on 2 or 3 kicks when it's cold and on 1st kick once it's warmed up. It idles very well from a cold start, nice and lopey. after abt 5 minutes or so, just enough time to warm up, she begins to idle higher. Not anything crazy high, maybe like the throttle is just barely open. First thing I am thinking is air leak but I've sprayed cleaner all around the gaskets, boots(JBM), and throttle shafts(yes, I have replaced throttle shaft seals with OEM yamaha seals). All of these have no effect, so it would seem there is no air leak. At least not one that I can find. The carbs have been gone through, cleaned, and rebuilt. I even replaced needle jet o-rings. The bike is running really rich on the left side and really lean on the right when reading the plugs. Seems like I might be over-jetted and have an air leak on the right(lean) side. On a side note, I used the dead cylinder method to set my air screws. I did this when the bike was cold. I also synced my carbs two nights ago. the bike was warmed up by the time we finished and it was doing the high idle thing. Question. Once the carbs were synced, if I adjusted the idle screw, it would throw the sync off. It would seem to me that the idle adjust should have no effect on the syncing of the carbs, correct? When riding, the bike wants to stumble a little bit when cruising with the throttle just cracked open. Once I give more throttle, this disappears and the bike runs strong all the way to WOT. I haven't done this much since the right side seems to be running lean. No holed pistons please. Running worse as it warms up is a sign that you're too rich. An engine needs more fuel when cold, that's why you have a choke. Higher idle when warm is normal for these as well. I think you have the idle speed set too high. It should barely idle on it's own when cold, idle speed rising to the 1200 spec when warmed fully. I assume you have the '79 carbs which would have a linkage. If so, adjusting idle speed will not change the sync. What is your jetting (mains, pilots) and where are the needles set? My best guess would be one to two (at most) up on the pilots (#30 or #32.5) and 2 to 3 up on the mains (140 or 142.5). Your needles should be leaned a step as well. Mix screws should be near or at the spec of 2 1/4 turns out, say somewhere in the 2 - 2 1/2 turns range. Also verify that your float levels are correct. If the fuel level is way low in the right carb, that could account for it running so lean. I'm nearly sure that I'm two up on the mains and one up on the pilot. I'm positive that I have lowered the needles one step. Also positive that when I set my mix screws using the DCM, one liked it at 2 1/4 turns, the other at 2 1/2 so that sounds right on with what you're saying Twins. I took my bike to a shop two weeks ago to have them look at this same issue and the guy there said he adjusted one(?) of my float heights. I have a thread where I confirmed my procedure for setting float height so I was slightly confused when he told me he adjusted one but thought "well, he's the pro.." but now I'm not so sure. Waste of $$ on that guy. I'll pull the carbs and double check jet sizes and float heights tomorrow, soon as I get home. Stand by till then. OK, it seems like you've got the float adjustment thing down pretty good. Don't forget to check from both sides. The float can be tweaked or twisted and measure fine one way, way off the other. And yes, check that guy's work, lol. Remember, you're setting/checking the floats with the carbs upside down so a higher number translates into a lower (leaner) fuel level when the carbs are flipped right side up. So, on the left carb, if you find it below 24mm, that may be why it's running rich. On the right carb, you'd be looking for it over 24mm to cause the lean running. 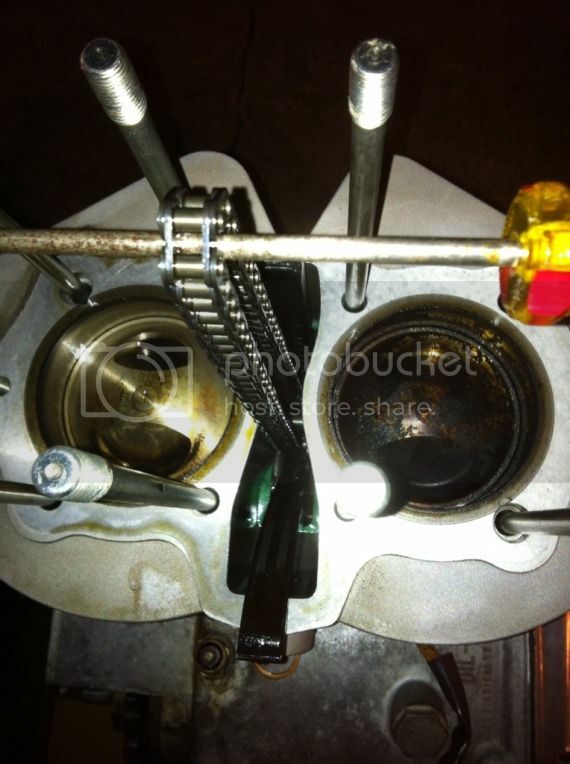 Another thing you can check while you have the carbs off is the choke plunger on the left carb. They have a rubber tip that seals them when off. If that's bad, you could be running with partial choke which would make that side very rich. Also check the mount screws for the choke assemblies. This may apply to the right carb - if the screws are loose, that could be your air leak and the cause for the lean running on that side. Ok, I pulled the carbs tonight. I will be making any necessary adjustments in the morning. First things first, I specified the wrong year for my carbs in my "float height" thread. I stated that my carbs were from '77 but that is incorrect, they are a set from '79. So, that will change my float height. Float height for 1979 is 24mm +/-1mm. This would make things a lil lean. Since I'll be measuring from the surface of the gasket, I'll be setting the floats at 23mm. What the hell, all my jetting is set at factory. I don't remember doing that. The bike isn't running that badly though, except for plug readings. Way rich on R side and way lean on L. Only thing I can imagine is that the rich side is compensating for the lean side and that's the only reason the bike is running decently on these jets. I didn't get to the the choke plungers but I installed new ones(MikesXs) when I rebuilt the carbs. I would imagine the rubber on the bottom of them is still good. I tightened the choke plates up a touch, they weren't really loose though. I never sprayed them when I was checking for air leaks but I will when the carbs go back on the bike. I believe I used gasket sealer on both sides of the choke plate gaskets when I rebuilt so I wouldn't expect an air leak here. I did find something surprising. After I pulled the float bowls, I gave the needle jets a wiggle and they both pulled right out very easily. I replaced the seals a while back with some 4mm x 1mm buna-n o-rings that I ordered from McMaster. Before I initially replaced them, I did some research and someone said this size and type of o-ring would work as a replacement but it's not working, at least not for me. Because of the new o-rings, the needle jets will not push down enough to seat all the way. The new o-rings seem to be too large in diameter(even though they are a snug fit on the needle). I tried gently tapping the needle jets in with a rubber mallet and basically, it shaved off the outside half of the o-rings, effectively splitting them in two. Maybe the left side needle jet was looser than the right and that's why the left side is running so rich. That'd be an easy fix, replace two o-rings and install proper jets. 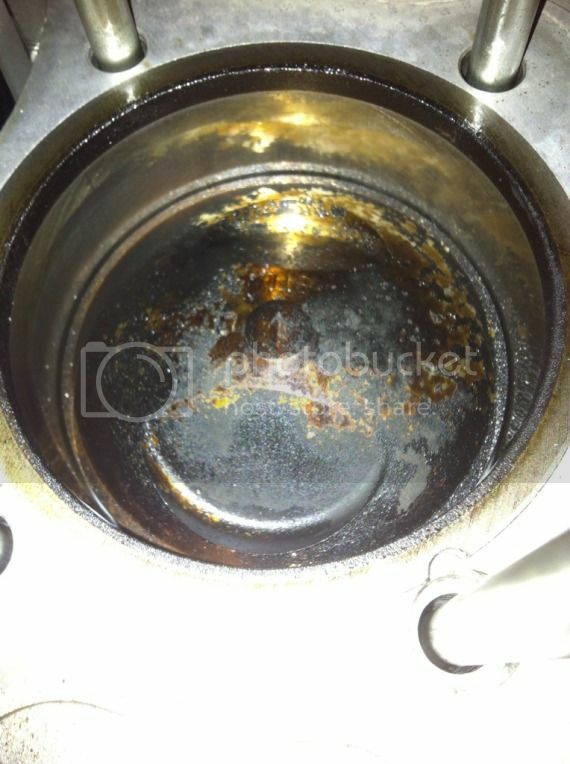 Do I need to be using gasket glue at the float bowl and choke plate gaskets? Where can I find proper needle jet seals hastily? Maybe I need to start a thread and see if anyone here has some extras laying around. I have some spare 1 mm thick X 4 mm ID Viton O-rings. They work just fine on my 78 BS38 carb needle jets. If you want a pair, I could mail them down to you, no charge. Your scenario sounds very familiar. Ran into this numerous times in the `70s. holes adjacent to the idle port, alongside the throttle plate), on the lean cylinder. have confirmed idle circuit contamination. On the 6s and 8s, the jet sometimes won't go in the hole all the way, the o-ring stops it. I just screw the bowl on and that pushes it in fully, eventually the o-ring pops into the hole. 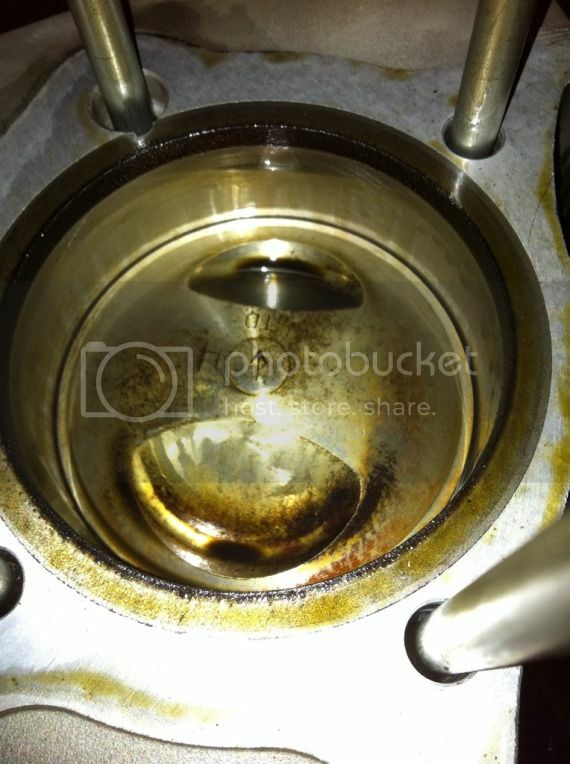 You shouldn't need or use gasket sealer on the carb gaskets. I wet them down with a light lube like WD40 or CRC556, that's all. oil (from a valve seal?) can look like a rich mixture on a plug. Ok Two, I will definitely check as the carbs are off the bike and won't be going back on until I get the new jets in(they should be here Monday). Ok Twins, no more gasket sealer. Good to know. I will try pressing a couple of Buna-N rings I have in using a lubricant, WD-40 or the like. They stick out quite a bit more than the ones in your pictures though. Oh, to have a picture archive like yours... that would be nice. Gggary, I think I may have a minor valve seal issue on my left side. When I start the bike after its been sitting for several days, It will usually smoke(white) just a little for a couple minutes but if I've been riding it everyday, it seems to barely smoke at all. Maybe this is why my left side looks so rich. When I pulled the plug the other day after riding, it was black as I assumed it would be but it wasn't wet looking. It looked very dry and dark black. I'll put a pair of O-rings in the mail to-day. Uh-oh, black smoke - gas, white smoke - oil. Sooty black plug - gas, shiny/hard black - oil. Also of note, Suzuki actually had the butterfly plates and plate screws in their listings as well, something Yamaha never did. Well then, it seems I'm getting mixed signals here bc, I get a little white smoke sometimes(oil) but the plug looks dry, almost sooty(gas) like you said. The way my bike is jetted and tuned currently, tells me it should be running very lean. I've got the factory size jets in it and the needle leaned a step, so with open intake and exhaust I almost don't see how it runs. And it does run, pretty strong in fact, just minor intermittent stumbling with the throttle barely cracked open. To me, it doesn't seem like the bike smokes enough to make the plug so black yet it will foul a plug in abt two to three days. Will oil foul a plug the way a rich condition will? Can I pull the head with the motor in the frame? If I pull the head to replace valve seals, I should probably replace valve guides too while I'm in there correct? Do you think I can get the bike jetted correctly and wait till after the weekend of the 26th before I pull the head and replace valve seals and guides? I have a 79 I will have to do a top on one of these days, it's going through a quart in about 3-400 miles, plugs look fine no smoke. Just opinion but an oil fouled plug will start to misfire and show soot from the misfire. The engine has to come out. Measure the valve/guide clearance, do guides if needed. If you can ride it an keep it running on both it should go awhile till you get to doing a top job. Keep a close eye on oil level. Well then it looks like I'm ordering parts and taking a day off once they get here. I'm gonna pull the engine and try to knock it all out in a day. I've done it once before when I installed my 750 kit. Just hate scraping gaskets. I had a similar problem on a 750 Bonneville – apart from the slight increase in RPM after warming up. The fault turned out to be a dud ignition coil, worked great when cold but packed up when warm. the smoke may go away. Just got the rings in the mail. Thanks again RG!! I'm gonna go put them in right now and see what happens. Not much difference with the new O-rings. I've got the (more) correct jets in it now. One up on idle circuit, two up on mains, needle lowered one step. The off idle stumble is worse now, it lasts a little longer through the RPM's than before. Not alot longer but it's noticeable. Just got the top end off. I was surprised when I pulled the head off and got a look at the cylinders. Remember, the left side has been fouling the plug and the right side has been somewhat lean. what I saw was the opposite of what I expected. I'm standing at the back of the engine, so left is left and right is.. you get it. I figured the left side would be dirty and the right would be clean.